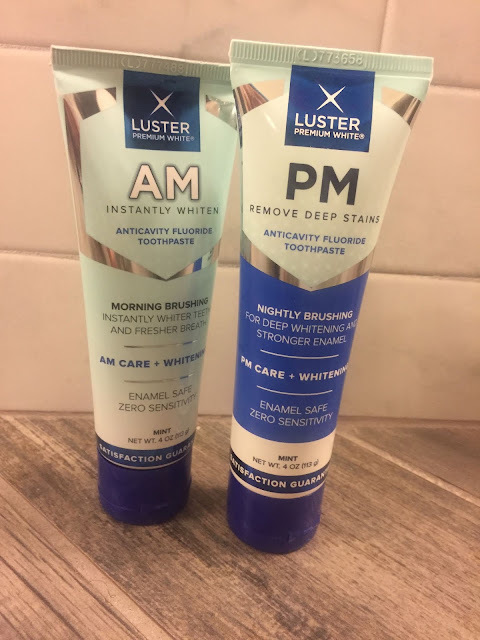 Pammy Blogs Beauty: NEW Luster AM/PM Whitening Toothpaste System: Get Whiter Teeth when you Brush! 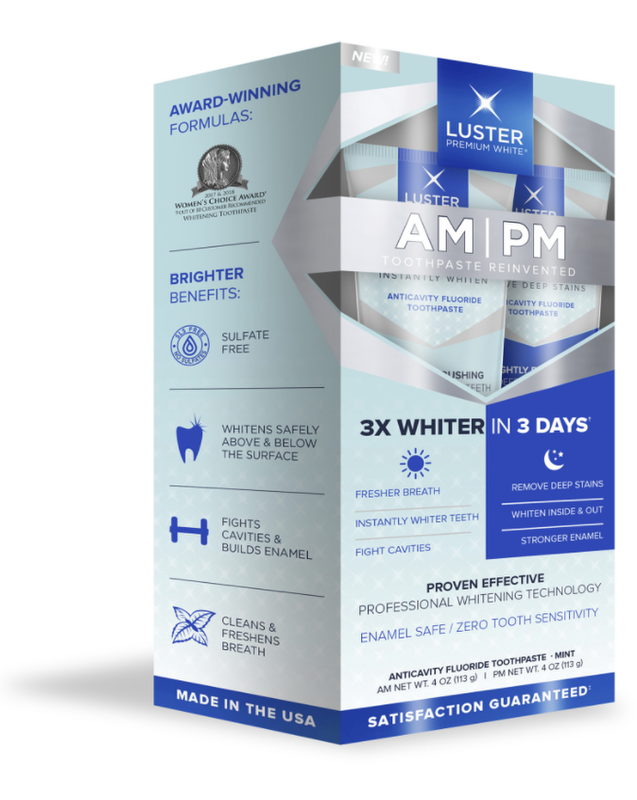 NEW Luster AM/PM Whitening Toothpaste System: Get Whiter Teeth when you Brush! This is the perfect tooth whitening system for when you want whiter teeth but don't want to add another step to your beauty routine. I love this system because it is so easy to use. Just replace your usual toothpaste and brush with the Luster AM/PM kit instead! This is the only daily whitening and cleaning toothpaste system that I know of that is designed around morning and nighttime dental hygiene needs. The system includes two toothpastes. Use Luster AM in the morning for instant whitening with just one brushing! It gives you fresh breath plus whiteness and stain protection. At night use Luster PM to remove deep stains, kill bacteria, and strengthen enamel while you sleep. Of course, the formulas also contain fluoride to fight cavities. All in all, you get professional grade peroxide-based whitening, clean teeth, fresh breath, cavity protection and stronger enamel, all with zero sensitivity. I am really impressed with this kit because I have sensitive teeth and I get no sensitivity reactions from this kit! Plus, I am pleased with the level of whitening that I experience when I use it. Last, but not least, I love that using this kit adds zero time to my morning and evening beauty routines. Just swap out your usual toothpaste for a whitening boost with this kit! Retails for $12.99 for the complete kit!